I haven’t forgotten Mr. Rilke, I promise. But I’m just taking a quick moment to celebrate: on Tuesday, we closed all submissions for The Los Angeles Review, Issue 8 . I’m not celebrating solely because I’ll get a couple hours of each day back once the issue’s put to bed, but also because I’m so pleased with this issue of the review. Looking over the list of contributors–some heavy-hitters in the literary world and some writers making their publication debuts, too–I really feel honored to get to read, select, and bring out the amazing work writers entrust to our care. Today, I sat on my living room floor today and did my penultimate ordering of the journal manuscript. As Managing Editor, it’s my responsibility to, about every two weeks, sit down with the ever-accruing pile of accepted material and look for threads of continuity among the fiction, nonfiction and poetry. For a couple of hours at a time, I crawl around the on floor, moving pieces here and there to watch their interplay, and to identify movements in the living group of work that makes an entire issue. If this sounds weird, it should. I always do this alone, and make sure even the cat’s in the other room. I don’t look like a well woman carrying out this task. But I find it fascinating that each genre’s editor/s work independently at LAR, but we find that, every time we assemble a complete journal, there’s a common theme underlying a great deal of the work. This time? Beasts. Real and imagined, human and animal. You’ll have to read the issue to see just what I mean. LAR, I should mention, is a big ol’ journal. We top out at well over 250 pages per issue, which, to my knowledge, isn’t common (though no one can rival Gargoyle, whose forthcoming summer issue, in which I’m excited to have a poem, is rumored to be about 500 pages long). 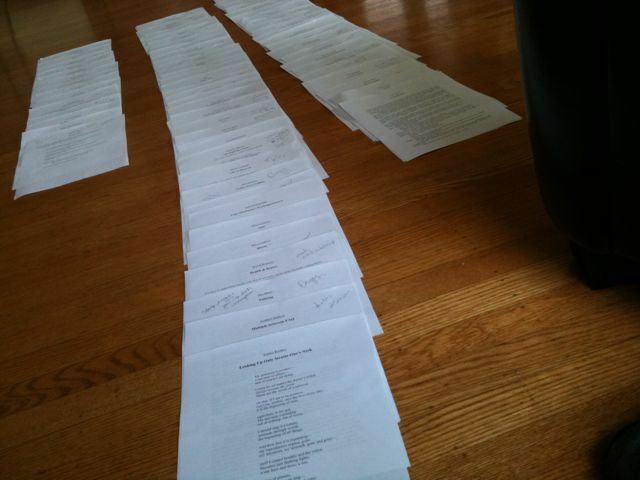 Poets, essayists and short fiction writers may not always realize the huge amount of obsessive work that goes into the ordering of a print manuscript, but I assure you: it’s there. I realize most readers open the table of contents, looks for names they recognize, then read, hunt, and pick their way through the rest of the issue. I’ll admit that I occasionally work that way as well. I think I learned that trick reading Good Housekeeping as a kid (it’s true: as an 11-year-old, I was reading Good Housekeeping, not Seventeen. The only periodicals in the house came as hand-me-downs from my grandmother, and I devoured the style tips for women old enough to be, well, my grandma). But after having read Ordering The Storm, a text on the structure of poetry manuscripts that was assigned by my mentor, Carolyne Wright, I have never been able to ignore the undercurrents of any amalgamated text. I’m fascinated by the threads (words, colors, emotions, sounds, images) that bind a group of work together. 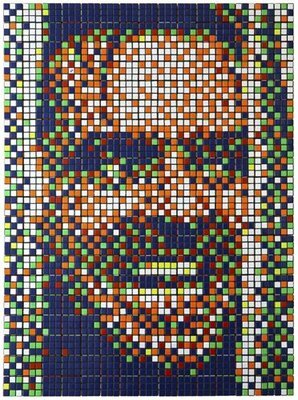 As I begin to analyze a document piece by piece, I’m no longer looking at the accepted works as units, but as colors or shapes in a quilt of greater scale. And my fellow editors and I couldn’t be more happy with the quilt we’ve stitched this time. I hope you’ll check this issue out. I’d love to hear what you think. Wow Kelly, I thought maybe that was a picture of papers on a table and then realized it’s your floor!! A very nice floor too =D I will definitely have to read this baby. As a fellow editor, my only lament is that there are far too many good pieces even for this jumbo-sized issue. There are still some tough decisions to be made in my section. Naomi, I outgrew the table about two months ago. 🙂 That’s about a ten-foot-long stretch of creative work right there! Please do check our baby out; we’re six proud parents. This is starting to sound creepy. Joe, isn’t it great that that’s the sort of problem we have these days? Of course it never feels good to turn down quality writing for lack of space, but it’s far better than scrambling for content. That floor is lovely! Congratulations on having a poem in Gargoyle – and, of course, congratulations on the next issue of The Los Angeles Review. It’s so nice to hear an editor that actually still cares about the flow of the pices in a finished piece. Much in the same way a musician crafts the flow of music on a CD. I will definately have to pick up a copy of the Los Angelos Review now that I now the level of thoughfulness that has gone into it’s creation.